Packing List: Southeast Asian Edition! When I was planning my trip to Thailand, I had a lot of anxiety about packing. At first I didn’t think it would be much of a problem—I’d packed for three months in Europe, going from winter in the UK to early summer in Portugal. Packing for one month in a consistent climate shouldn’t have been hard, right? Wrong. Fortunately, it was pretty straightforward once I got there, but I wish I had had an explicit packing list before I left for Southeast Asia. So here’s my best list, covering a range of topics for young travelers looking to balance nightlife, socializing, and cultural learning opportunities. 1 pair of long pants, not jeans. 1 skirt: longer than knee length, for temples and cultural sites of interest. 1-2 evening outfits: dresses, skirts, nice tops. 1 pair of versatile sandals—I brought Keens with me and they served me well. 1 sarong, from home or brought there. ipod, phone, reading device if necessary. YOU WILL SWEAT. Be prepared to sweat… don’t worry, everyone else will be sweating with you. Bring lightweigh, quick-dry clothes if you can so that you can rinse them later. You will only need long sleeved clothing for visiting temples and the Grand Palace. I noticed that my knee-length skirt was deemed appropriate in instances when Alex’s calf-length shorts were not, and therefore I did not have to borrow or ‘rent’ clothing (at a refunded price of 500 baht). Sarongs are also appropriate in lieu of a long sleeved shirt when wrapped around your shoulders and chest. The tourist nightlife is essentially devoid of any sensibilities. Do not feel the need to dress especially modestly under these circumstances; dress to your comfort level. Bring a backpack, not a suitcase. Buy a large bag when you get there to fill with keepsakes. Also, leave some space in your backpack for the things you must pick up along the way. You can get amazing bags for 20 dollars or less, some of them even handmade. You may want to bring little things to give to local children– little teddy bears, pins, bouncy balls, anything. They love it. And last but not least– this is VERY important!– you should bring a teddy bear! I acquired a teddy my first few days on my Europe trip and resolved never to be without one again. Plus, the maids tend to do silly things with them when you leave them in your bed, which is always endearing. 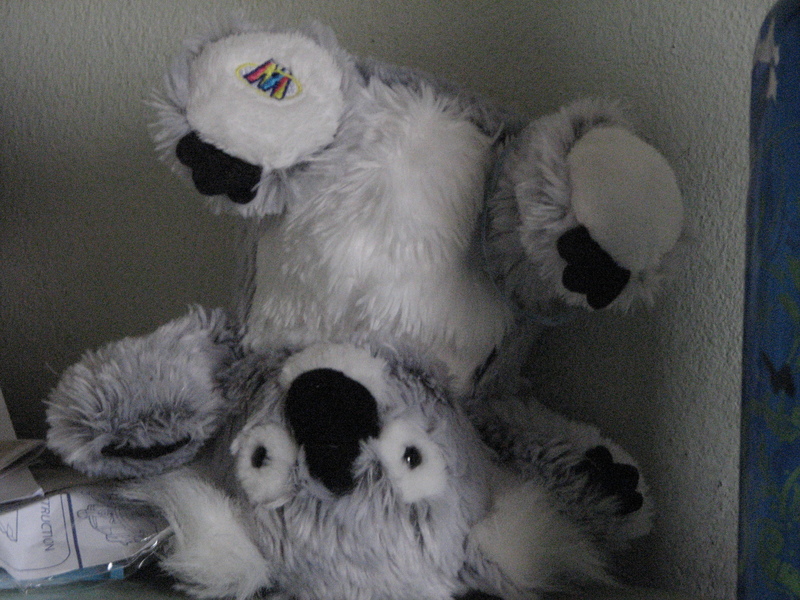 Lala/Sebastian holding the headstand pose the cleaning lady put him in. I did just remember one final thing– a teddy bear! Ha. Adding now.